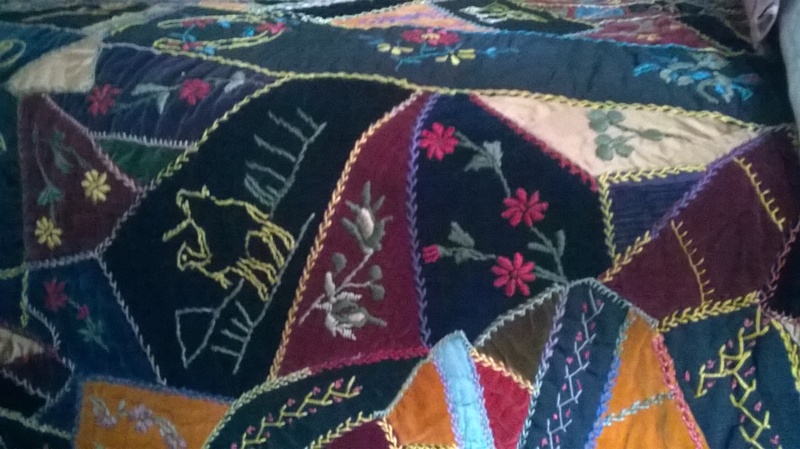 Last week, on a cold day, with snow still on the ground, a group of quilters gathered at Beamish Open Air Museum (www.beamish.org.uk) at Beamish, County Durham, DH9 0RG, to view some of the historic quilts in their collection. I’d been quite unwell with one of those winter viruses that makes you feel you have been hit with a baseball bat, but I really wanted to take advantage of this special opportunity, which had been arranged by my friend Pat, so I went along too. 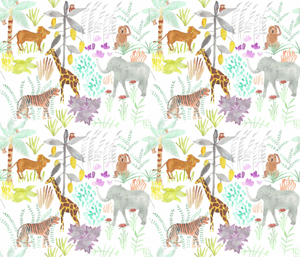 We were reliably informed that the exotic-looking pattern was actually inspired by a hay-spade – hence the shapes! 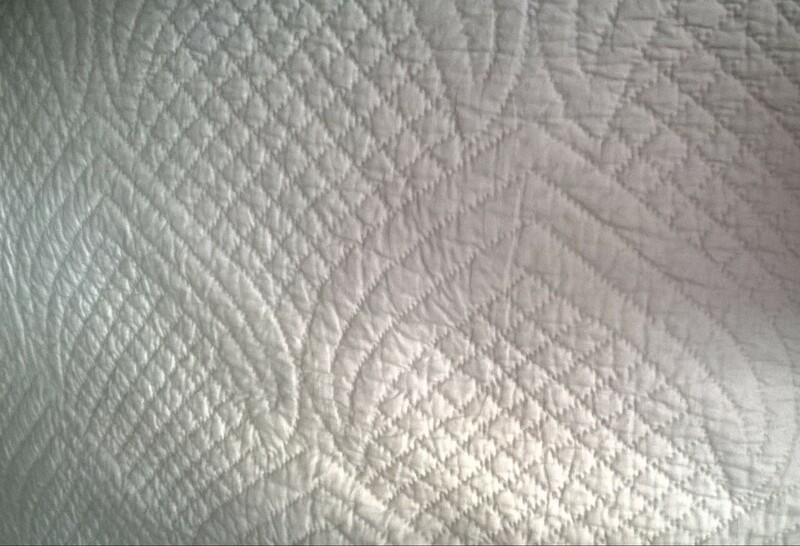 Some quilts (like this green and white one from 1880) demonstrated the same lovely stitching over a patchwork pieced top (where different shaped material pieces are stitched together in patterns, before the quilting stitches are done). 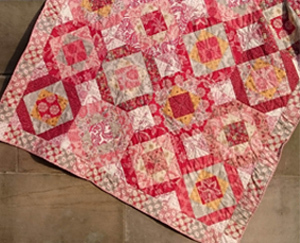 For this pink, blue and white quilt, there was some information about the origins of the piece: it had come from the ‘Thompson family’ in ‘Weardale’ and was dated 1890. Now, I am a genuine Geordie. My birth certificate and passport have ‘Newcastle-upon-Tyne’ on them, even if my southern upbringing has not furnished me with a Tyneside accent. I definitely had the impression that my ancestral roots were firmly planted north of the river Tyne. 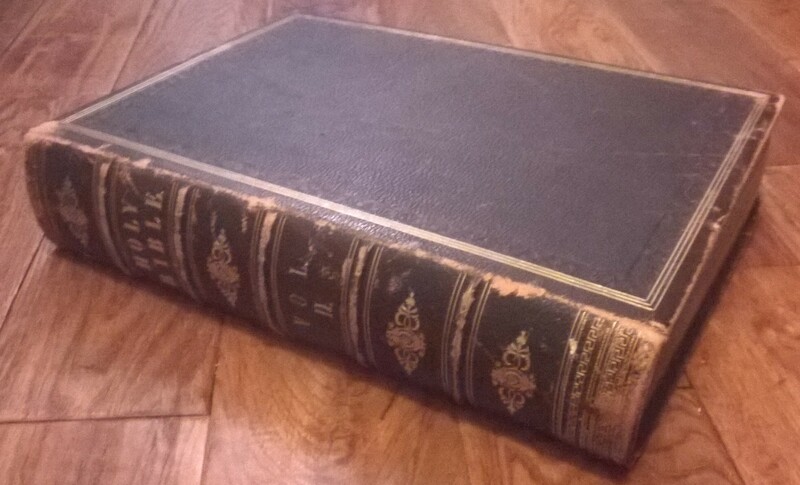 However, I am in possession of a monumental family bible (this is just one of the two volumes). 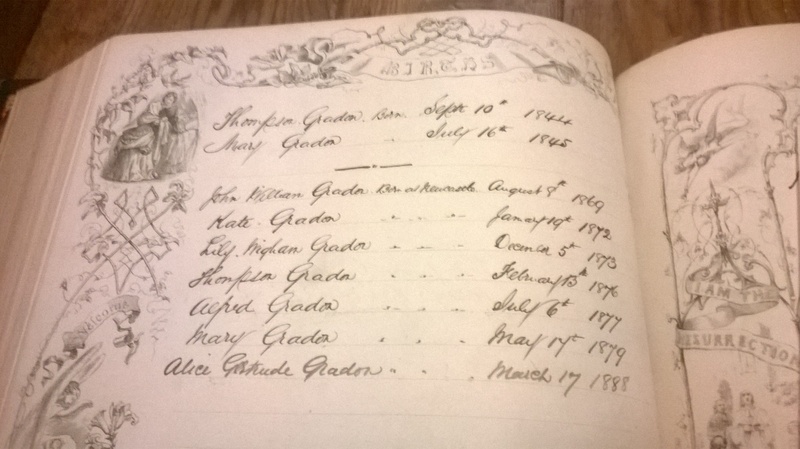 In this list, Gradon is the surname and Thompson appears (twice) as a first name. It was also my uncle’s first name, but I remember being told as a child that Thompson had also been a family surname in the past. 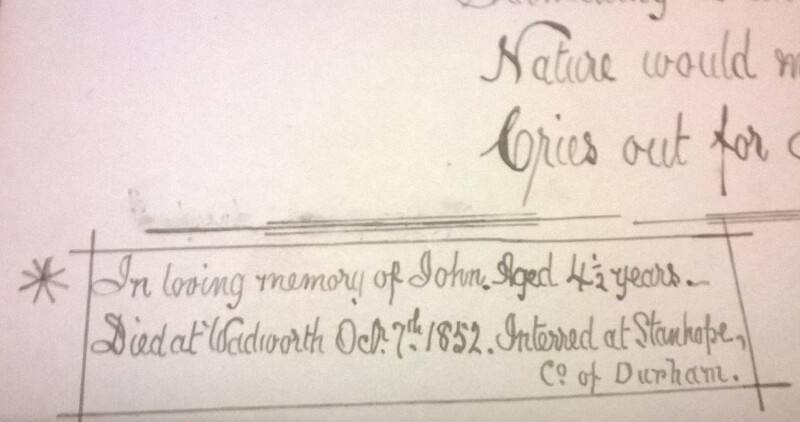 There was also a very touching poem, inserted between the pages of the bible, written by a Catherine Gradon in memory of her son (called John Gradon), who died in 1852 and was buried in Stanhope in Weardale. Now, Weardale is very much south of the Tyne, so I have had to revise my ideas about where my forebears lived, whilst marvelling that having lived in a number of different locations in the UK, I’ve now settled in Durham. 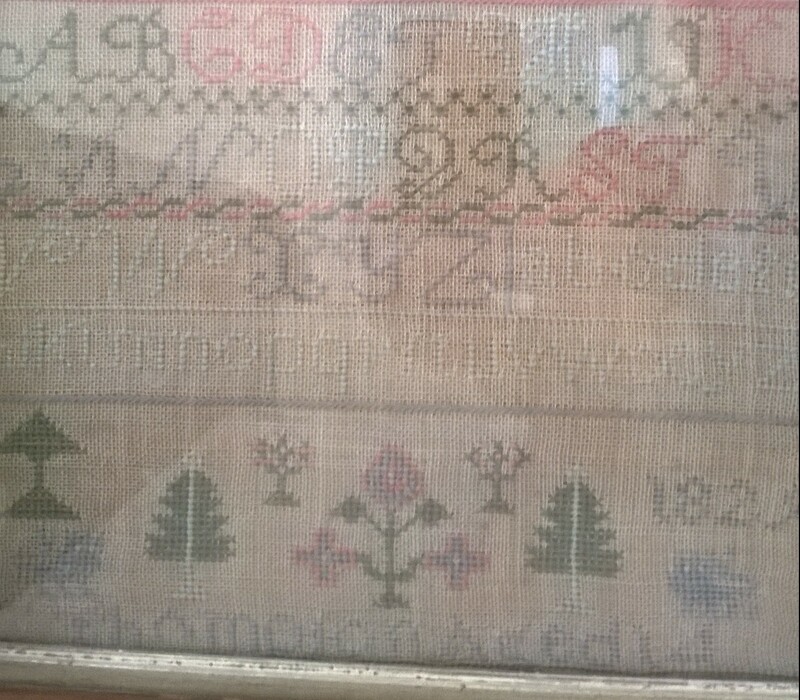 And here’s another little clue: a sampler from a relative’s house (a second cousin). This sampler is dated 1829 and the maker (aged 14, this time) is a ‘C.Thompson’. Her name is stitched in pale blue and is partly obscured by the frame at the bottom. I’m so glad I went on the trip.